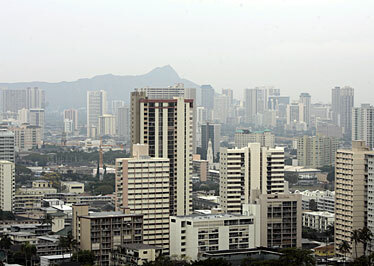 A heavy layer of vog over Oahu was due to the volcanic eruptions on the Big Island. Diamond Head was barely visible as it was shrouded in vog from this view from Punchbowl. Hawaii health experts, emergency officials and lawmakers tried to determine yesterday how dangerous Kilauea's thick volcanic smog is. No one really knew. Doctors had no hard data showing the vog is causing new ailments. Emergency responders discussed Big Island evacuation plans but did not know how bad the vog would have to get before becoming a public health crisis. Only a few things were certain: Big Island residents will have to learn to live with the vog for the foreseeable future, and those suffering respiratory illnesses need to find ways to cope depending on their symptoms. 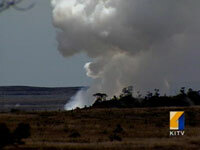 Hawaii health experts and lawmakers met yesterday to assess vog's danger. 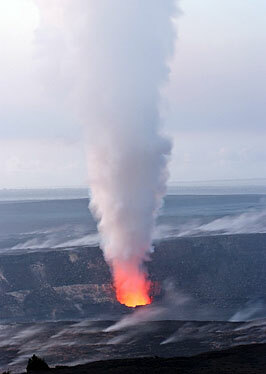 Here, a plume of sulfur dioxide gas and ash rises from Halemaumau Crater atop Kilauea volcano in Hawaii Volcanoes National Park. "I don't know if the answers are going to be there from a health perspective," said Dr. Cliff Field, medical director at Kau Hospital in Pahala, at a meeting with lawmakers at the state Capitol. "We're not going to know the effects of it until months or years down the road." Chiyome Fukino, state health director, said there has been no significant increase in emergency room visits among asthma patients. Lawmakers are meeting to determine how to better protect the public from recent increased amounts of vog. However, those with respiratory problems could become more agitated by the vog, Field said. People with health problems might eventually have to move away from the volcano, install air filters in their homes or buy respirators, said speakers at the first meeting of the House Special Committee on Vog Effects. Heavy clouds of vog have been erupting from Halemaumau Crater since a new vent opened March 12, adding to the existing vog puffing from the Puu Oo vent. Kilauea has been erupting for more than 25 years and is the world's most active volcano, said Jim Kauahikaua, scientist in charge of the Hawaiian Volcano Observatory. "The more likely scenario is that it will go on for a while or decline very slowly," Kauahikaua said. The Health Department and representatives from Hawaii's hospitals discussed closer collaboration to study whether prolonged exposure to vog and its toxic sulfur dioxide cause new health problems or merely agitate existing ones. Elected representatives considered ideas for installing air conditioning in hospitals or air purifiers in schools after they heard of students being sent home from school because the vog was making them sick. "This is going to be a lifestyle change for all of us living here," said Hawaii County Fire Chief Darryl Oliveira. "We don't know what the long-term health effects will be. People need to rely on their own personal symptoms or comfort level." The vog committee's chairman, Rep. Bob Herkes, suggested that residents using water catchment systems should be advised of ways to make sure their drinking water is safe. When the vog mixes with rain, it can create acid rain, which could result in elevated levels of lead in water. "The people I talk to don't know about these things," said Herkes (D, Volcano-Kainaliu). "We need some help. People don't have a clue what to do." Some people in the meeting also suggested improving a color-coded system that attempts to advise residents when vog levels are high. The committee will meet at least two or three more times to continue its examination of the vog's effect on public safety, agriculture and the economy. Then it will make recommendations about how to handle the situation.